Topic: Caudron-Renault C.445M Goéland "Seagull"
Developed by aircraft designer Marcel Riffard to meet the need for a fast, economical and comfortable transport to carry a limited number of passenger, the Caudron C.440 Goéland (Seagull) twin engined low-wing cantilever monoplane made its appearance during 1934. Test flown by Raymond Delmotte, it proved it pedigree by combining economy with aerodynamic excellence. One of the most successful aircraft oft its time, it was produced in greater numbers than any other transport in it category. The two-spar wing was of spruce and plywood with a plywood skin, and inboard of the inset ailerons the whole trailing edge of the wing was occupied by flaps which also extended beneath the fuselage. The fuselage was largely of wood and had plywood skinning except for the nose section and upper decking which had stressed sheet metal covering. The cantilever tail unit was also a wooden structure, its fixed surfaces plywood-covered and control surfaces fabric-covered. Streamlined nacelles for the 220 hp (164 kW) Bengali 6-cylinder engines extended below and to the rear of the wings; and the main landing gear units, each incorporating an oleo-sprung fork, retracted rearwards to lie wholly enclosed within the engine nacelles. The prototype had fairings attached to the front of each main leg to cover the wheel wells when the landing gear was retracted, but the next two C.440s had two wheel well doors attached to the underside of each nacelle, a feature of all future Goélands. A non-retracting steerable tailwheel was fitted. In its basic passenger configuration the Goéland had comfortable cabin accommodation for six passengers. The pilot and co-pilot, who doubled as wireless operator, were seated side-by-side and had dual controls. Baggage holds were located fore and aft and a toilet was situated at the rear of the cabin. The Goéland remained in production in several versions up to World War II, the principal model being the C.445, also adopted by the Armée de l'Air as the C.445M and used for a variety of tasks, including military communications duties and crew training. Some C.445Ms were used by the Aéronavale. Civil users of the Goéland included Air France. Air Bleu and Régie Air Afrique. Air Bleu used one C.444 and several C.445s on night mail routes from Paris to the Spanish border, and Régie Air Afrique operated the type on its North African routes. Other Goélands flew passenger services in French West Africa and Madagascar. The type was sold abroad to Aeroput of Yugoslavia and to Bulgaria and Spain. 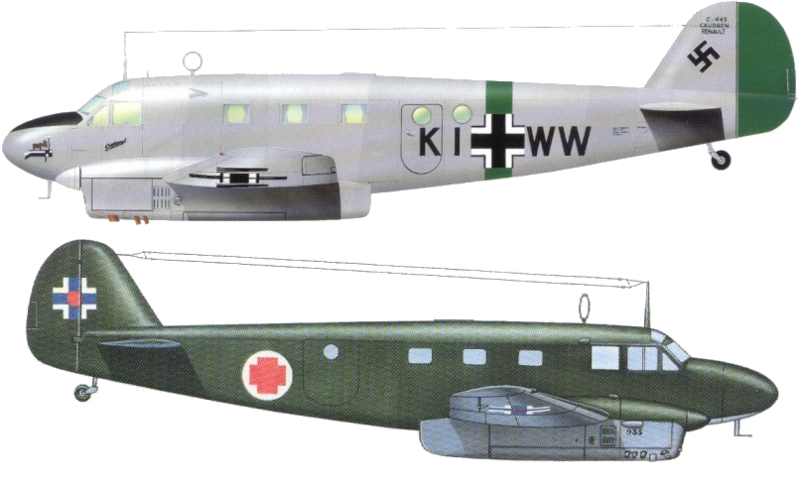 Two C.445Ms were supplied to the Belgian Aéronautique Militaire in 1940. Production continued during World War II, and after the German occupation of France 44 C.445s and 10 C.445Ms were requisitioned, some flying on Lufthansa routes and others being operated by the Luftwaffe. 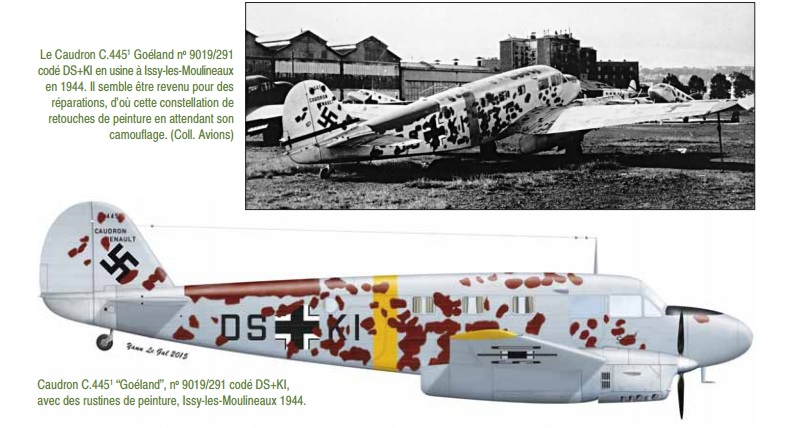 Considerable numbers of the C.445M and C.449 were built for the Germans at Renault's Billancourt and Caudron's Issy-les-Moulineaux factories. Production at Billancourt, however, was reduced to a trickle after a heavy RAF raid in 1943. The Germans used the Goéland as a pilot, radio and navigational trainer, for communications and a small number had glazed noses for bomb-aimer training. 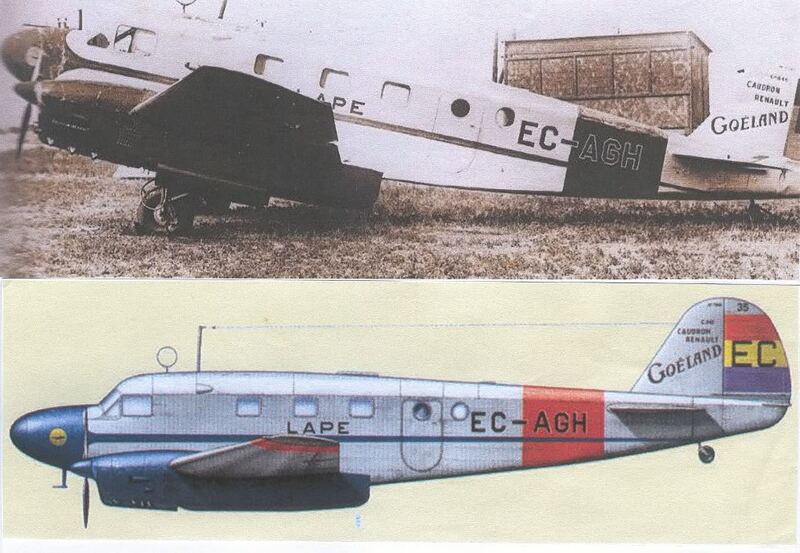 In addition to the C.447 specialised ambulance version, a few other Goelands were used for casualty transport. Other Goélands served the French Vichy regime, while a number were scattered throughout France's overseas empire, most of them in North Africa. Several C.445s operated in the UK after June 1940 with Free French forces. In 1945 the Caudron plant was taken over by the French government as the Ateliers Aéronautiques d'Issy-les-Moulineaux. Here production of the C.445M and C.449 continued under the designation AA.1. 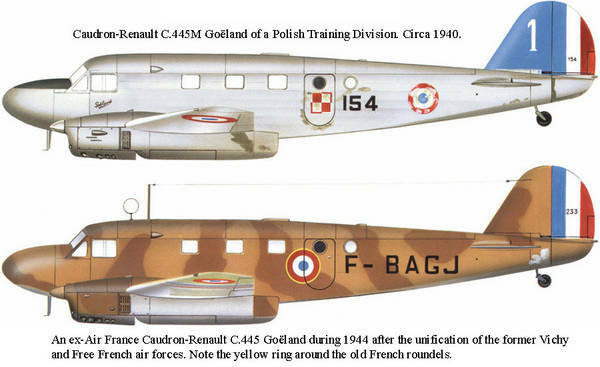 Post-war Goélands continued in service with Air France. At the beginning of 1946 the company had 23 C.445s and 19 C.449s at its disposal, these flew domestic night mail services for a time, but were employed for many years as crew trainers. Other civil operators included SABENA and two French companies, Aigle Azur and CAT (Compagnie Air Transport). Goélands continued to fly for a number of years on a wide range of duties with the Armée de l'Air. Production of all versions of the Goéland totalled 1,702. A number of early aircraft were converted subsequently to later versions. The production listing below totals 1,446 as it has not been possible to verify the sub-type designations of the remaining 256 Goélands. Caudron C.440 - The original prototypes and the first two production aircraft. Caudron C.441 - Powered by two 220 hp (164 kW) Renault 6Q-00 Bengali 6-cylinder inline piston engines engines. A minor wing change included a 3° dihedral on the outer wing sections (4 built). Caudron C.444 - The first version to introduce counter-rotating engines and propellers (Renault 6Q-00 and 6Q-01) to overcome torque effects (17 built). Caudron C.445 - Similar to the C.444, but wing dihedral was increased to 4° (114 C.445s, 2 C.445/1s and 3 C.445/2s were ordered but only 40 were built) . Caudron C.445M - This was the militarised version of the C.445 with the internal layout varying by the role (404 built). Caudron C.445R - A long distance variant with additional fuel tanks in the passenger cabin (1 built). Caudron C.445/3 - One of the principal post-war versions, with counter-rotating Renault 6Q-10 and 6Q-11 engines (510 completed). Caudron C.446 - A single aircraft with minor improvements and named the Caudron Super Goéland. Caudron C.447 - An Air Ambulance with accommodation for four stretchers and additional side windows (31 built). Caudron C.448 - Powered by supercharged 240 hp (179 kW) Renault 6Q-02 and 6Q-03 engines. Maximum take-off weight increased to 8,157 lbs (3700 kg) (7 built). 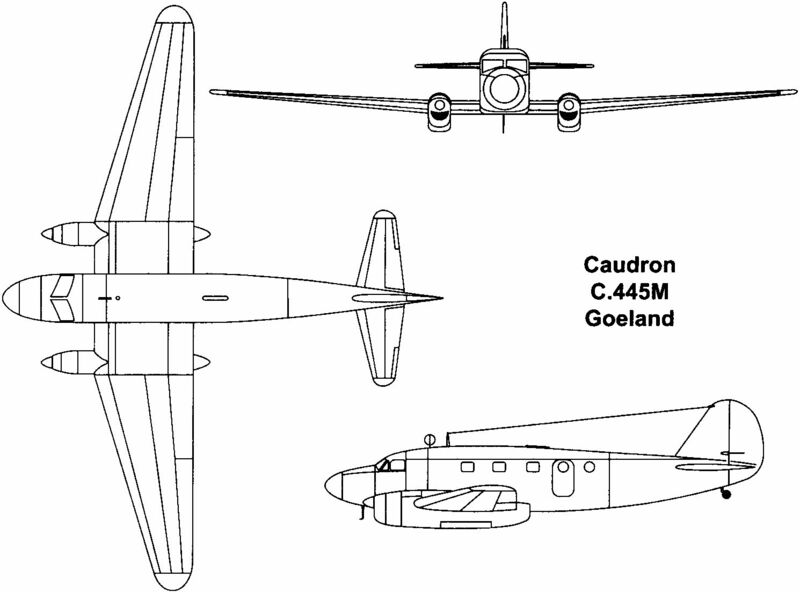 Caudron C.449 - The final production model (349 built, many post-war comprising of 24 basic C.449s, 298 C.449/1s, C.449/2s and C.449/3s and 27 C.449/4s and C.449/5s, the C.449/4 being a specialised photographic aircraft). Powerplant: Two 220 hp (164 kW) Renault 6Q-00/01 or 08/09 Bengali 6-cylinder inline piston engines. Performance: Maximum speed 186 mph (300 km/h) at sea level; economical cruising speed 162 mph (261 km/h); service ceiling 22,965 ft (7000 m). Range: 621 miles (1000 km) on internal fuel. Weight: Empty equipped 5,053 lbs (2292 kg) with a maximum take-off weight of 7,716 lbs (3500 kg). Variants: C.440, C.441, C.444, C.445, C.445M, C.445R (long range), C.445/3, C.446, C.447 (air ambulance), C.448, C.449. History: First flight (C.440) in 1934 by Test Pilot Raymond Delmotte. Operators: France (Armée de l'Air, Aéronavale, Vichy Air Force, Free French), Germany (Luftwaffe, Lufthansa), Yugoslavia (Aeroput), Bulgaria, Spain, Belgium, Slovakia (Slovenské vzdušné zbrane), Italy. Re: Caudron-Renault C.445M Goéland "Seagull"